So, in previous pAsurams, he (maNavALa mAmunigAL) showed the unequaled greatness of SrI vachana bhUshaNam among the rahasya granthams authored by piLLai lOkAchAryar, the reason for naming it as SrI vachana bhUshaNam, that those knowing and following it are one or few only, advising others to learn it, figuring out reason for others to not learn it with love, and that if there is any vyAkyAnam for it that are supported by AchAryas then it is acceptable to learn from it, it would be of unlimited sweetness for self and others. and taking that (SrI vachana bhUshaNam) as reference for the meanings of ways of ultimate stage that he is going to convey in the upcoming pAsurams in this prabandham, he is showing that to us in the last stage starting from this pAsuram and forward. Under this, in this first pAsuram, if those who do not have even a little love towards their own/special lord (asAdharaNa SEshi) that is AchAryan, even if they do have devotion towards the universal/common lord (sAdhAraNa SEshi) that is emperumAn, He who does bhakthi (towards AchAryas) would not wish to give such other people the ultimate goal (prApyam); so he is saying that they would not get that ultimate goal. than guruvin thAL iNaigaL thannil – It is in the two divine feet of AchAryan who is as said in ‘maruLAm iruLOda maththagaththuth than thAL aruLAle vaiththa avar [gyAna sAram – 36]’ (AchAryan placed his divine feet on the disciples head and removed the darkness that is ignorance), and who is available for one self, that it is appropriate to do prapaththi. It is said only as ‘avan thALiNaiyE unnuvadhE sAla uRum [gyAna sAram – 38]’ (it is only apt to depend on the divine feet of AchAryan). anbu onRu illAdhAr – those who do not have any bhakthi; it is in the matter (AchAryan) that Iswaran himself too do bhakthi that they live without a lot of devotion; emperumAn‘s devotion is as said in ‘anthAmaththanbu [thiruvAimozhi 2.5.1]’. What if we live without that? What if we get bhakthi towards emperumAn? 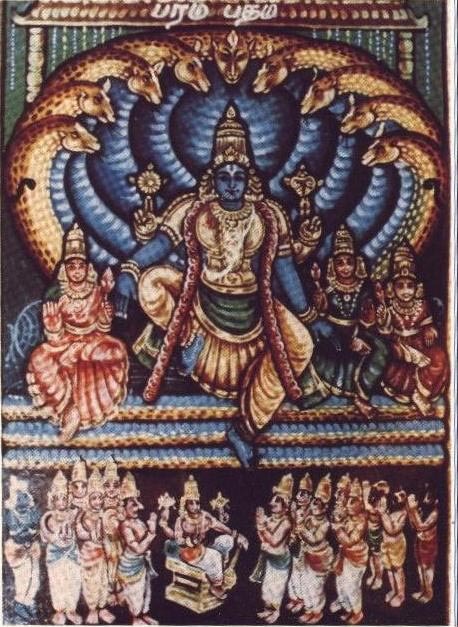 ambuyai kOn inbamigu viNNAdu thAn aLikka vENdiyarAn – By way of being target of AchAryan’s grace due to which pirAtti (thAyAr / goddess Lakshmi) recommends us to emperumAn, then as said in ‘gyAnam kanindha nalam koNdu nAdoRum naibavarkku vAnam koduppadhu mAdhavan [rAmAnusa nURRanthAdhi – 66]’ (~ mAdhavan gives SrIvaikuNtam to those having true knowledge that has matured into devotion and is desperate every day to reach Him), such mAdhavan (pirAtti’s husband), would not have any love in the first step itself when it comes to giving the ultimate place for people who do not have love towards the matter of AchAryan. AdhalAl naNNAr avargaL thirunAdu – In this way if one who has to give doesn’t give, they would not get attain the goal, the goal called as ‘theLivisumbu thirunAdu [thiruvAimozhi 9.7.5]’ (SrI vaikuNtam). It is said ‘prApya lAbham prApakaththAlE [SrI vachana bhUshaNam – 99]’ (goal is achieved through emperumAn). inbamigu viNNAdu – He who has taken vow to give the ultimate place (SrI vaikuNtam) for those who do good towards Him, would not like to show that generosity towards such (aforementioned) people. viNNAdu thAnaLikka vENdiyirAn – Since such people don’t have the liking on the matter (AchAryas) that He likes the most in SrIvaikuNtam, He would not like to give such people the parama padham that is having the name of ‘paramavyOma [SaraNAgathi gadhyam]’ (highest place). So, it would be hard for them to get the thirunAdu (SrIvaikuNtam) as said in ‘kidandha UzhiyAn pAdhammaruvArkku uNdAmO vAn [mudhal thiruvanthAdhi – 91]’ (Would they who do not have devotion towards emperumAn‘s divine feet get SrI vaikuNtam?). He who is generous as he gives SrIvaikuNtam saying ‘vAnavar nAttaiyum nee kaNdukoL [thiruvAimozhi 3.9.9]’ (you shall get SrIvaikuNtam), would ignore them and not give it, what is the means for them to get the ultimate goal that should be gotten? They would lose it is all, as said in ‘izhandhE pOm iththanai enRu manaththuyirkkum’, etc. By this, it has conveyed the meanings (of SrI vachana bhUshaNam) starting from ‘AchArya sambandham kulaiyAdhE kidandhAl [SrI vachana bhUshaNam – 437] (if relationship with AchAryan stays without diminishing..), through ‘iththai ozhiya bhagavath sambandham dhurlabham [SrI vachana bhUshaNam – 440]’ (without this, it is hard to get the relationship of emperumAn). This entry was posted in Other, upadhESa raththina mAlai and tagged 74, annan, erumbi, erumbiappa, inbamigu, kovil, mamunigal, manavala, paramapadham, pasurams, rathina, rathinamalai, raththina, raththinamalai, upadesa, upadhesa on January 31, 2016 by raghuram.